1. Boil the Jersey Royals with a few mint stalks for 15-20 minutes until just cooked. Drain and reserve the cooking liquid. Meanwhile, slice the courgettes lengthways and char grill on a griddle pan for 3-4 minutes. 2. Cook the sea bream in a pan, skin side down, with a little oil and butter for 1-2 minutes each side. 3. Cook the peas and broad beans in the potato water for 3 minutes and refresh and leave to one side with the potatoes. 4. To finish, reduce about 2 ladles of the cooking liquid and add the butter and the remainder of the chopped mint. Add the Jersey Royals, peas and broad beans into the cooking liquid until heated through. 5. To serve, divide the vegetables and juice into 2 shallow bowls, top with the courgettes then the fish, skin side up, dot with ricotta and a squeeze of lemon over the fish. 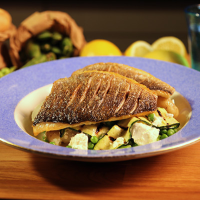 If you like, at step 2, cook the sea bream in the oven at 180°C, gas mark 5, for 2–3 minutes instead of frying it.